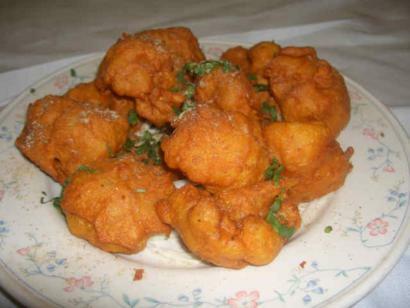 North Indians frequently serve this luscious pakora selection at wedding feasts. It adds a festive touch to almost any occasion, from brunch to late-night supper. Unless the cauliflower flowerets are cut very small, parboil or half-steam them before deep-frying. Make certain that the pieces are thoroughly patted dry and room temperature before batter-dipping. If you are making the batter by hand, rather than in a food processor or blender, use ground coriander or fenugreek instead of the whole seeds. 1. Combine the flour, salt, 2 teaspoons (10 ml) ghee or vegetable oil, chilies, ginger, fenugreek or coriander seeds, fresh herbs and 7 table spoons (105 ml) of cold water in a blender or a food processor fitted with the metal blade. Cover and process until smooth. (if you mix the batter by hand, substitute ground spices for the seeds and work with a balloon whisk until smooth). Gradually add the remaining water, or enough to make a batter the consistency of heavy cream. Cover and set aside for 10-15 minutes. 2. Again beat with an electric beater, wire whisk or your hand for 2-3 minutes to further lighten the batter. (Check the batter consistency: if it is too thin, moist foods will spatter as they fry; if it is too thick, they will not cook properly. Add flour or water as necessary). Stir in the baking powder.